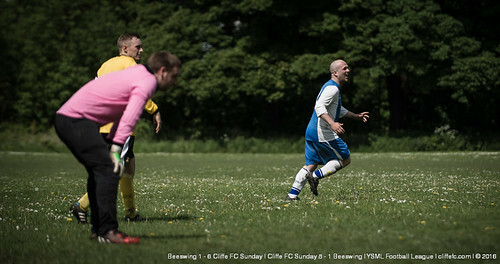 Cliffe FC Sunday finish 12 points clear at the top of the YSML Division 2 table, winning 6-1 and 8-1 in a double header against Beeswing to close the 2015/16 for the club – Nathan Parker reaching 40 goals for the season having notched 9 goals on the day. Once again Selby Olympia’s Recreation Road ground hosted a Cliffe FC fixture, Cliffe FC would like it to go on record their thanks to Selby Olympia FC for allowing hire of their facility over the last few months. Malt Shovel FC and Brayton FC also hosted a couple Cliffe FC games, and the club would like to thank them also. Cliffe FC, in conjunction with the Cliffe Playing Field Association, hope to begin and complete drainage works at their Oxen Lane home over the summer so football can return to the village of Cliffe next season. 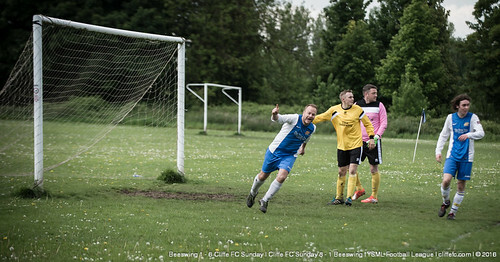 Sunday was the final fixture of a marathon season for Cliffe FC, Beeswing the opponents for Jackson Lucitt’s Sunday team – a double header on a sunny but damp Sunday morning. 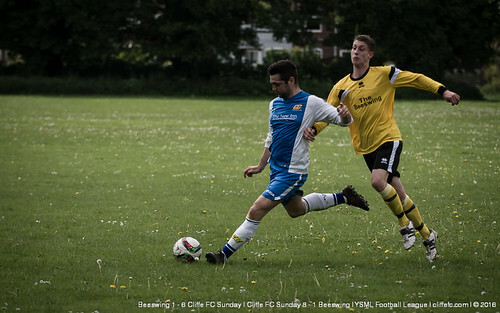 As per last season, manager Lucitt set a target of maximum points after securing the title – but Beeswing weren’t there just to make up numbers and they had the lead early on making it 1-0 – a deserved lead for the York side. Nathan Parker levelled things before the break in the first of two games, a shot into the top corner, 1-1. The second half saw Cliffe dominate – Parker rolling the ball into the bottom corner for 2-1 and and Ryan Tiplady chipping in with a goal after pouncing on a rebound, 3-1 Parker completed his hat-trick with another placed effort into the bottom corner, 4-1. Parker quickly scored his forth for 5-1 and Tiplady scored his second to make it 6-1 FT in Game 1. 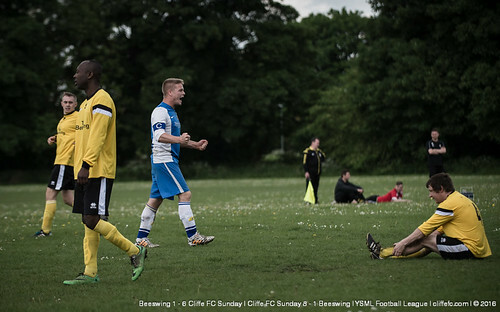 Game 2 was a matter of Cliffe carrying their dominance from Game 1 into the second 60-minute match. Parker scored a penalty, then a lob for 2-0. Beeswing scored from a corner to peg Cliffe back at 2-1, before Parker completed another hat-trick to make it 3-1 a header off at Tom Hogg freekick. Alex Hartley scored a superb long range effort to make it 4-1. Parker had a forth before the HT break, another penalty, 5-1 HT. Second half, Dan Richardson got in on the act, reacting quicker than strike partner Sean Gallagher to claim a goal from close range for 6-1. Parker scored again, a powerful effort too hot to handle from inside the box, to make it 7-1 – taking his personal goal tally for the season to 40 goals – matching Chris Jackson’s haul in the 2013/14 season, albeit on a Sunday morning, not Saturday afternoon as per Jackson’s record. Richardson completed scoring, being assisted by Gallagher, to complete scoring at 8-1, FT.
Cliffe FC Sunday finish the 2015/16 season 12 points clear at the top of the YSML Division 2 table, three more points than the 9 point gap they won Division 3 last season. A superb effort from Jackson Lucitt (and assistant Matthew Birch) and his squad. A number of big tests await this squad next season in the top division – a challenge that both Lucitt and Birch are relishing.